Dr. Karen Pascoe is a Licensed Psychologist, Licensed Addiction Counselor, Certified Personal Trainer, Certified Therapeutic Yoga Teacher, and a Experienced Registered Yoga Teacher (E-RYT 200) with Yoga Alliance. Since her career beginnings she was aware of the dynamic relationship between mind and body. Working as a personal trainer while pursuing her Masters Degree in counseling, she saw how exercise improved her clients’ moods, thoughts, and disposition. 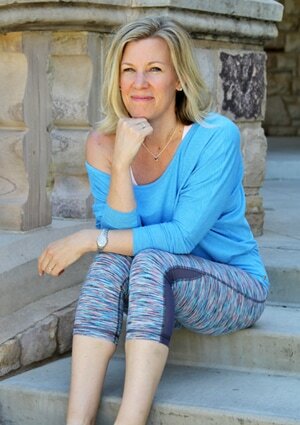 She began teaching yoga in 1996 at a health club where she was the fitness director and a personal trainer. The feedback from her students complimented what she saw; her students were getting more physically fit and reporting improved moods and mental abilities and that yoga was having a positive impact on their lives. As a therapist at a hospital in New York City, she began treating individual’s recovery from both mental illness and substance dependency. In this role she also incorporated a mind-body approach by offering cardio groups and yoga classes in addition to standard group and individual therapy. During her doctorate studies she continued teaching yoga throughout the Denver Metro area and she worked as a therapist at a drug and alcohol treatment center and at a college-counseling center. As a Licensed Psychologist at Jefferson Center for Mental Health she was honored with the Recovery Champion Award for her success in aiding clients with mental illness and substance dependencies achieve recovery. The importance of the interrelationship between the mind and body has remained undeniable throughout her career. The power of the mind to elevate the body coupled with the influence a healthy body has to strengthen the mind can change someone’s life. She is thrilled to launch the Mind Body Life Transformation Center, which represents a personal dream: to truly integrate these intertwining practices of mind and body therapies, and offer them together in a safe and beautiful space. With expert guidance and support, the Mind Body Life Transformation Center aims to help people reach and surpass their mental and physical goals and truly transform their lives.